I am in a matter lip colour love phase. Matte lip colours look so amazing and stay longer but the only problem is they dry out my already dry lips and so regular lip exfoliation becomes necessary. I scrub my lips the night before with homemade DIY lip scrub and follow it with lip balm. Next morning my lips are a smooth soft canvas for bold matte lip colours. 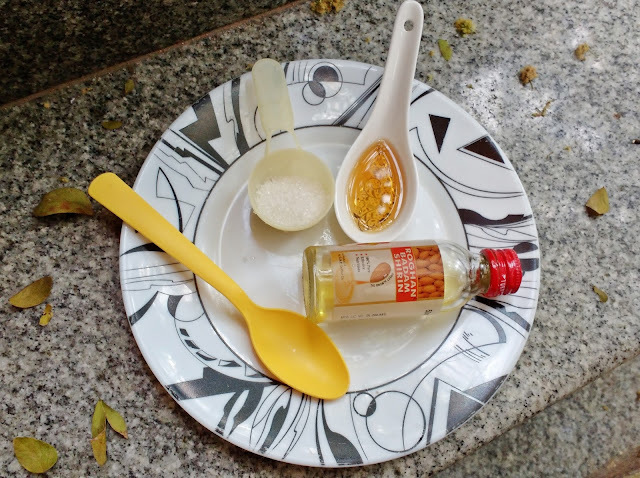 I mostly use the almond oil+ honey+sugar lip scrub , the recipe of which I have already shared on this blog here but things can get a bit boring and if you want to try more flavors and scents with different ingredients I have come back with mor DIY lip scrub recipes. Almond oil is something Iam addicted to at present as I am using it a lot for my hair and dark circles. This oil also works well nourishing my lips when I use it in a lip scrub. If you still havent tried almond oil for skin care, You should give it a try soon because it is very affordable multi purpose oil. You can actually use Vaseline or your regular lip balm to make a hydrating DIY lip scrub. Just mash up some of your lip balm or vaseline in a bowl , add some sugar and mix well. If you are using a lip balm you can add some coconut oil to thin out the scrub. If you are making this scrub with vaseline you can add just a drop or two to the mix. Now apply this DIY scrub on your lips in circular motion to gently exfoliate. For a yummy edible lip scrub mix two parts sugar, one part coconut oil and one part honey. Apply a little bit of this on your lips and scrub the dead cells, bidding bye to those crappy chapped lips. I personally think this is the easiest lip scrub for super dry lips as coconut oil is very moisturizing, honey is a healer and more importantly you might already have these ingredients in your kitchen. Mix and blend all ingredients together and use it to exfoliate your lips the affordable and natural way. If you are making this with 2 spoons of sugar you will definitely have a lot left for next use which you can put it in an empty lip balm jar and store in refrigerator. This lip scrub is all natural and preservative free still it can be used for 2 weeks easily when store in cool place. If you have pigmented or dark lips, exfoliating them properly can help lighten them. It is best to use a lemon lip scrub for dark lips because lemon juice has natural bleaching properties. You can use lemon juice or lemon essential oil for this DIY lip scrub. Also if you have dark lips I suggest you use a good SPF lip balm to pretect your lips from sun rays and further darkening. Mix all ingredients together until they are combined into a paste of sorts. Now apply on your lips and scrub in circular motion for about 30 seconds and wipe off with a damp cloth. If you like minty lip balms like me you will love this peppermint lip scrub too. Not everyone has peppermint essential oil stocked in your home but if you still want a minty lip scrub , I have a cool idea, just nicely crush a chloromint chocolate and add to this scrub instead of peppermint oil. No really, Iam not joking it works and works like a charm. For oil you can use any essential oil of your choice like jojoba oil, almond oil or coconut oil. Mix all ingredients in a empty clean jar and tada minty amazingly scented DIY lip scrub is ready to soften your lips. No one likes chapped and peeling lips and it is always good to exfolitae lips witha lip scrub. Exfoliating lips helps get rid of dead skin cells to reveal soft supple new skin layer underneath. Lips are very delicate because it has very less cellular layers, these layers also lack natural oil producing glands making them dry out faster. So make sure to nourish and hydrate your lips with a good lip balm and exfoliate regularly. The quantity of ingredients isnt very important when making lip scrubs. You can adjust the quantity as per your requirement . Like if you want a more nourishing lip scrub add more oil, for a more exfoliating scrub increase quantity of sugar. When adding essential oils to lip scrub make sure they are organic and pure. You can use any sugar of your choice. White sugar is what I have readily available at my place but it is more coarse and abrasive. It is best to use brown sugar or caster sugar. Be very gentle with your lip scrubs or you will end up with blood stained lips! Follow exfoliation with a nourishing clear lip balm. I have tried finding a good affordable lip scrub in India and the options are almost non existent. If you are also in the same boat fret not and start whipping your own all natural DIY lip scrub recipe.